We're excited about this short film made by Syracuse University / WILDER Compound students Augie Cummings and Spencer Garrison. Augie and Spencer decided to make this film as their independent study for the course through Syracuse, and it is incredible to have their footage from every workshop crafted into such a great overview of the project. Nice work, guys! 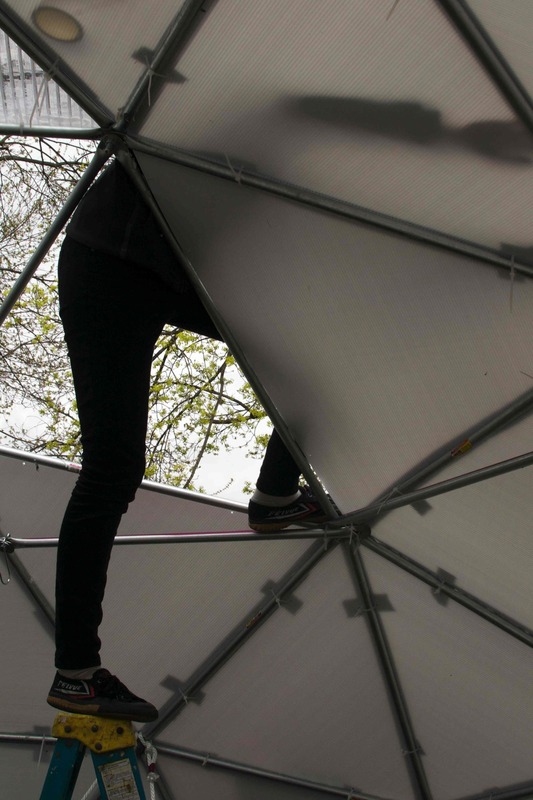 On May 3rd, We celebrated completing the Geodesic Dome and our final Workshop! 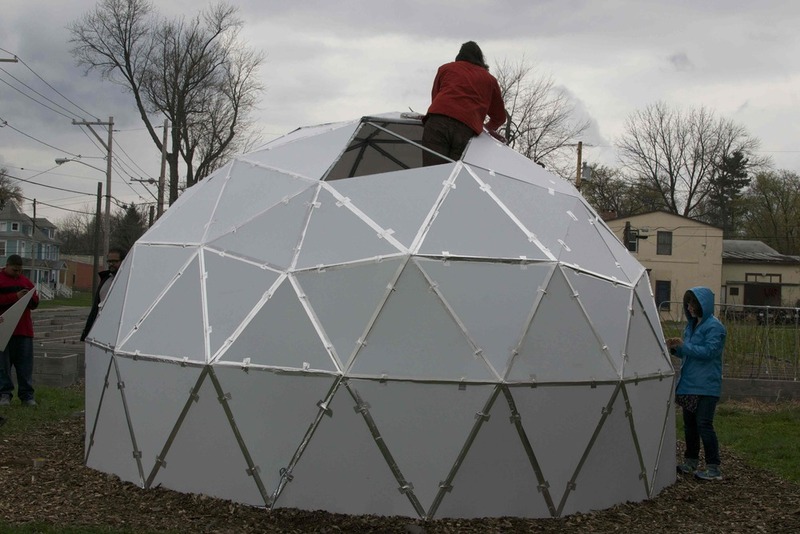 We had food, music, screen printing t-shirt workshop and we finished the Geodesic Dome with a stronger covering! The community was invited and we were so happy they came! It was great to hear that the community was happy the SU students were involved in the project at the Southwest Community Garden. We had several activities and great home-made vegetarian food! All of the plates, cups and utensils were compostable, so we collected the trash and put it in the farms compost pile! My module will focus around providing the community with information regarding food and nutrition. In designing my module I wanted to keep the community’s needs and interests in mind. Through researching existing workshops and literature regarding nutritional education, I was able to take away that a hands-on approach would be most effective. My objective is to provide community members with information regarding food groups, portion sizes, and how to read food labels. 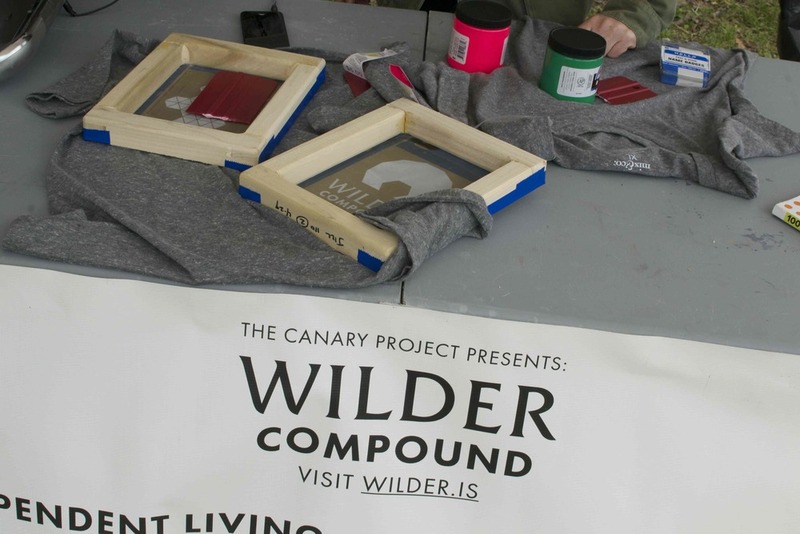 The WILDER workshops emphasize the idea of community and engagement. I wanted to further that emphasis by incorporating group discussions throughout the workshop. Through group activities I hope to keep members engaged and interested. Group discussions will also allow participants to gain knowledge through each other, as well as through the instructor. One important aspect of the workshop is its adaptability. Not only is the module adaptable to different areas but I also want to make it adaptable to different age ranges. The concepts had to simple enough for younger kids to understand but informative enough to allow adults to walk away feeling informed. I feel the hands on activities and group discussions will appeal to all age ranges. I can see slight modifications made to the group discussions based on age range. For example, older participants may be asked, “What’s your favorite meal to cook at home?” Younger participants may be asked, “What is your favorite fruit or vegetable?” Both scenarios can easily lead to a meaningful and informative discussion. 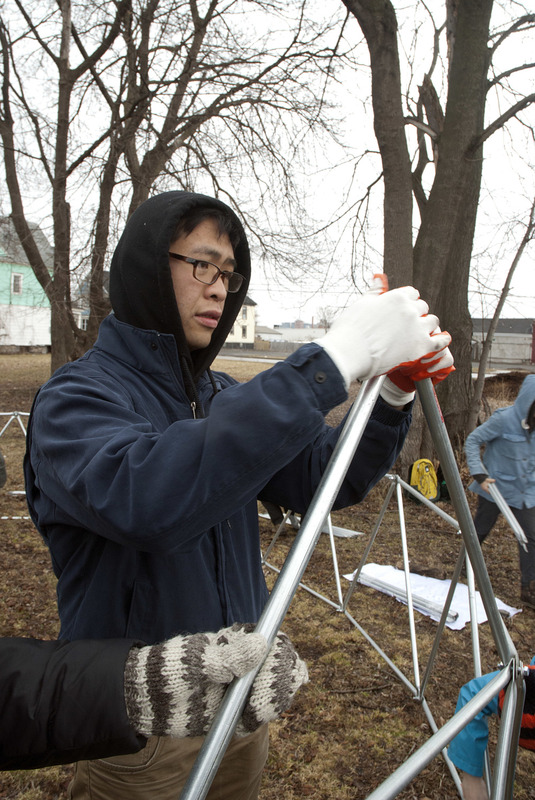 During our fourth workshop we built a geodesic dome greenhouse for the Southwest Community Garden! While half of our group bolted the dome together, the other half moved mulch to the new site of the dome to level the ground. 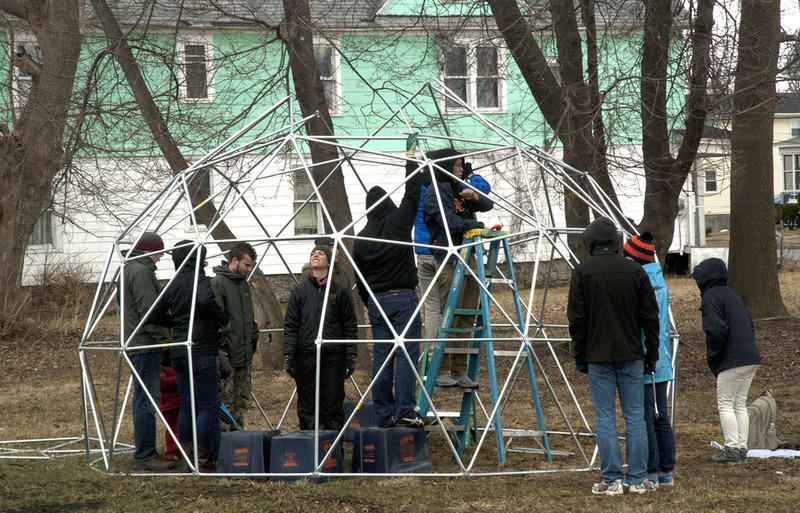 Even though the weather was blustery, we finished the dome and had a discussion of what projects we are going to do during the party on May 3rd. Kaylah, Anna, Michaela, and myself are a part of a food studies course (FST 402) examining urban food systems, their various components, historical development, as well as the disparities of food access that exist within them. 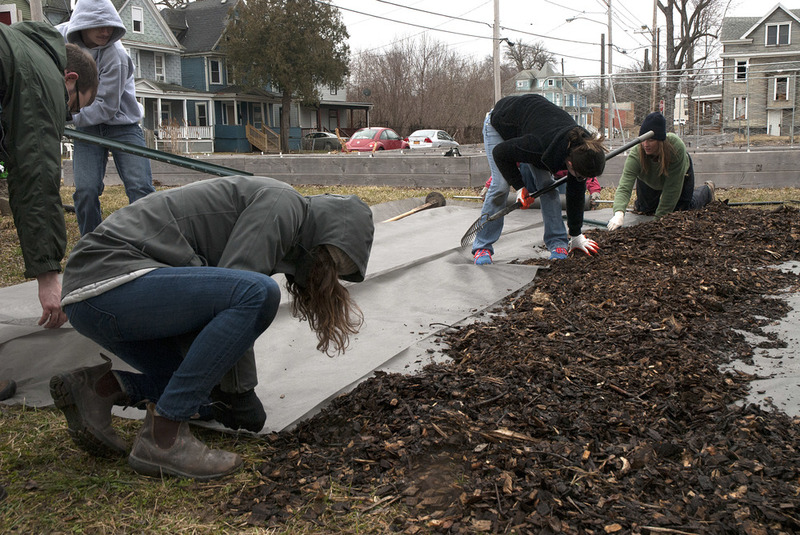 The class seeks to better understand urban food systems as a means of identifying more pragmatic ways to improve them. 1. Storytelling - Storytelling as a means of entering a discussion about respective cultural food ways. 2. Cultural Nutrition - A means of introducing foreign foods within a nutritional and gastronomic context, inviting participants to share their engagement with/knowledge of certain foods, or lack thereof. 3. Nutrition and Community - How do we define community? Identifying where communities intersect with food and the resulting health of a particular population. 4. Geography of Food - Mapping the food environment participants experience within their own communities. Discussing the concepts of food deserts and structural violence. Brainstorming how we could redesign our own food system in Syracuse. The goal is for the curriculum to offer a collective learning experience. They will exist in writing, and will hopefully become a part of the WILDER.is site to be utilized/adapted by the public at large. 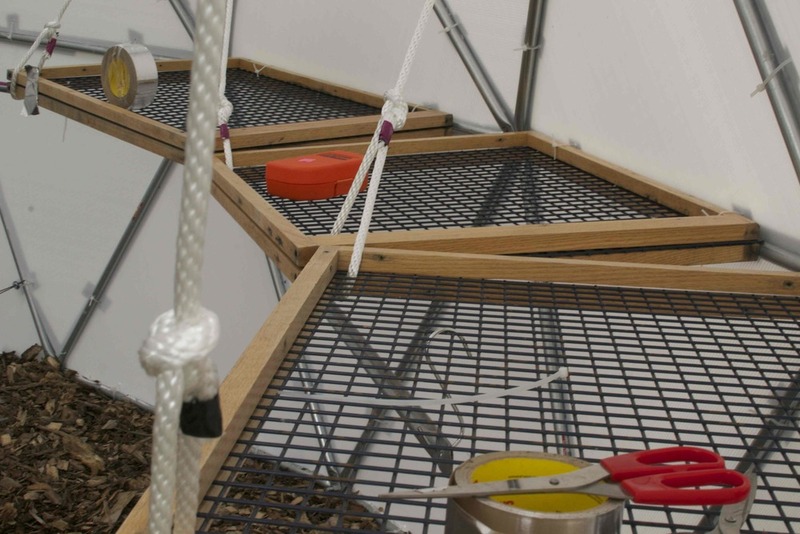 We will also be implementing one of the modules at the end of day, April 19th (the Grow Your Own Food workshop). We're excited to share our findings and ideas with everyone, and will keep you posted on our project's progress!